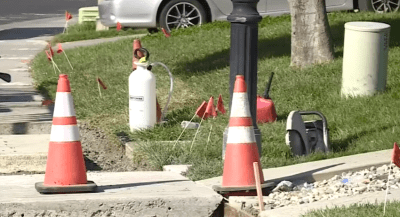 AT&T’s contractors turned a Dixon, Calif. neighborhood into “a disaster zone” while attempting to install fiber optic cables for a forthcoming upgrade. For almost half a year, AT&T’s outsourced construction crews have dug up yards around the growing community of 19,000, located 23 miles from Sacramento. The Valley Glenn neighborhood has seen the worst of it, according to homeowners who complain crews left concrete debris buried in their front yards, killed their lawns, and have been inconvenienced by heavy equipment partially blocking streets for months. Two weeks ago, an AT&T contractor crew hit a gas line, forcing the evacuation of the entire neighborhood. Heather Craig, another homeowner, reports her lawn is struggling to recover. “They put concrete instead of dirt back underneath our grass, so it’s dying,” Craig said. Neighbors agree AT&T has been remiss on keeping the neighborhood informed about the duration of the construction and have not given them information about who to contact to discuss damages and concerns. AT&T responded to the concerns earlier this week.